Luxembourg Ville was never likely to be my favourite place. I enjoy small villages, where everyone in the pub knows each other, or places with enough energy for the arts to coalesce into excitement and innovation. The latter usually means big cities, although places honeypotted around a great poet, like Cambridge with Prynne, are the best. The population of Luxembourg, the country, is smaller than a big city, so there’s little chance of the capital being arts significant (and, if it is, I’ve missed it), although the authorities do try. 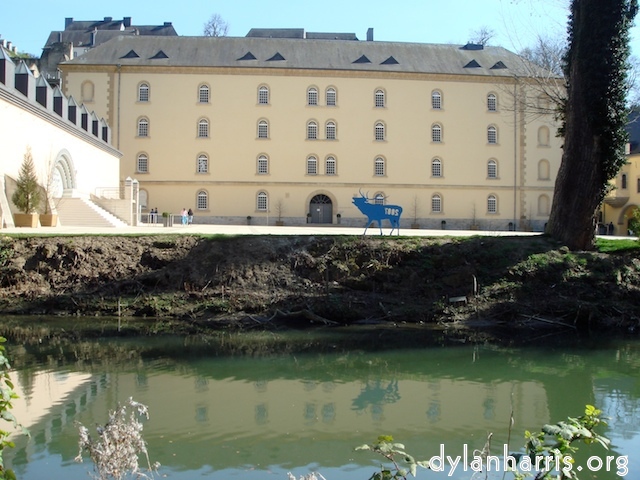 Luxembourg Ville is a glorified county town, with only its status as a capital making it unusual. It mixes county town sleepiness with international awareness, a combination which isn’t possible in the Great Britain. But it’s not for me. Now you understand my eyes, you can better see the sights in my descriptions. Luxembourg, the country, feels like Derbyshire. It’s got heavy industry in the south, and difficult hills in the north. The hills are the Ardennes, and very pretty too. If you get the chance, take the train from Luxembourg Gare north to Troisverge; the railway is a classic branch line; single track, tight curves following river banks, pretty little stations in picturesque villages. Unlike Derbyshire, though, Luxembourg is extremely rich; it is very rare to see a house not in tip top condition with fresh paint. 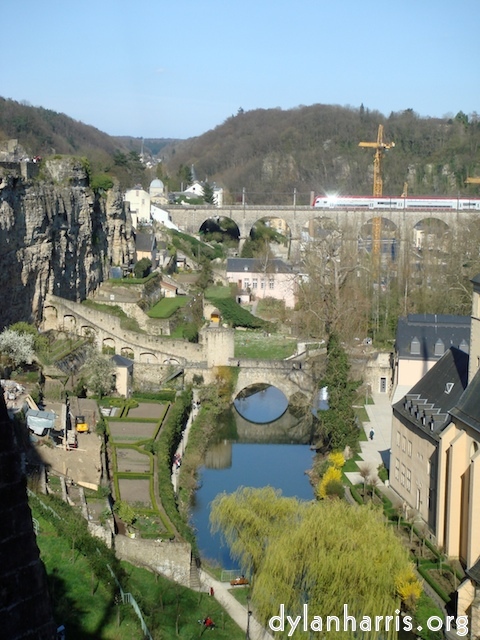 In fact, last year, Luxembourg had the highest GDP per capita of any country in the world. This wealth is built on banking; the country’s banks offer the same kind of facilities as those of Switzerland. 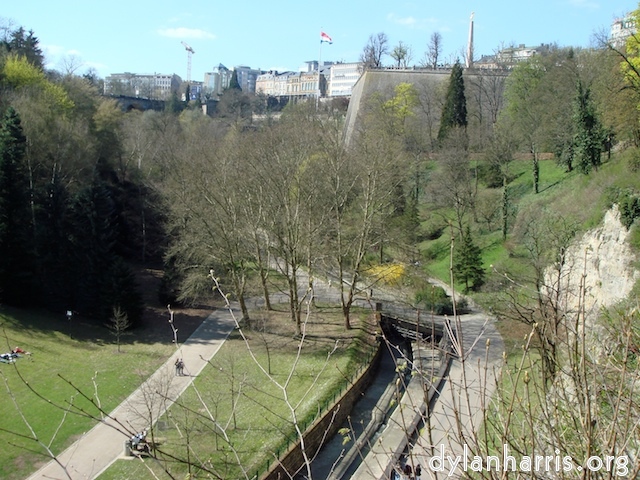 The capital, Luxembourg, is built at the junction of two gorges. This hints its origins: a garrison town for a military fort. The fort was demolished as part of the Treaty of London, which made the country at the beginning of the 19th century. Many old military tunnels still exist, though, opened up as tourist traps. The town has two centres. The old centre is dominated by profiteers of the feminine arms race. To my ignorant eyes, the fashions shown are staid and dull compared to those in, say, Antwerp. Other shops sell toned down kitsch as art, although maybe I missed something interesting. Possibly the only thing for brains is a book shop; the trouble is my French is too poor to know whether it’s exquisite and intelligent, or merely an equivalent of Waterstones. Basically, the old centre’s for fluff with dosh. The other centre is Le Gare. In truth, there are just a few more interesting things; an underground music shop, a couple more book shops, and a supermarket or two. It’s a little more than just another high street, but not worth the effort of visiting. A third shopping centre is forming out in Euroland, but that’s so full of packet chains it’s clearly targeted at fluff with less dosh. Although shopping in Luxembourg Ville is hardly worth the effort, the restaurants are worth exploring. I don’t rate most of them as exciting (I haven’t visited any in the Red Guide), but I was very pleasantly surprised by the Indian restaurants. They’re much better than the average Indian in the UK, which are, in turn, better than the average Indian in Belgium or France (in my experience). They’re worth a visit. One of the town’s two gorges has been made into a park. This is a brilliant idea. Despite winding between the two centres, it provides a long, peaceful walk, just a few feet from patient drivers and impatient shoppers. It leads to the main gorge, full of medieval buildings and bars, which hasn't been touristed into meaninglessness. There’s that public lift from this gorge to the old centre. Patient drivers? Yes; if you wait by a crossing they’ll stop and invite you to cross. If the rest of the world drove like the locals here, they’d be far fewer injured pedestrians and road rage would be restricted to horror novels. Well, except for the local taxi drivers. I can’t recommend them, they’re unprofessional. For example, unlike, say, London cabbies, they’ll refuse a ride if they don't think they can make money out of it, no matter what your need. I hate to think what other all–the–place tricks they get up to. Use other transport, if you can. Most natives are quadro–lingual. They speak the local language, the dreadfully named Luxembourgish, plus German, French and English. Luxembourgish is similar to German, with French imports. In fact, until WW2, it didn’t exist. After WW2, the locals were so hacked off with the German occupation (the second in twenty years) and annexation, they switched the official language from German to French, and deliberately moved to develop their own, which has grown out of what was the local German patois. Overall, I’m glad I spent a while living in luxembourg, and I’m glad I moved on. It’s a good place, but too small for me. 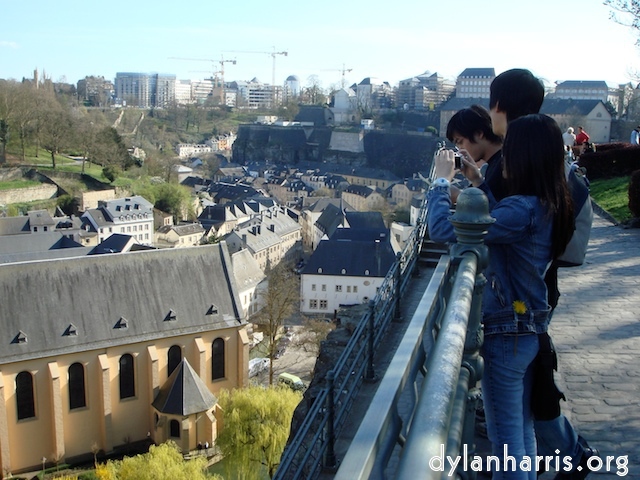 In September 2012, I returned to Luxembourg. The city remains small, but TGV Est is running: Paris is two hours away. Luxembourg is now much bigger, and much smaller. See my updated opinions.